I did not want to spend a lot of money on the boards so making them small made sense. I also wanted the component count to be low. I don’t need super-exact readings, so I discarded adding a buffered input or an opamp amplifier. Using Moteino as the platform is also a good choice. The board is small and with just the proper components. It supports different radios already and it’s meant to be stackable. And the awesome work of Felix Rusu and Thomas Studwell with the RFM69 library with automatic power transmit control and RocketScream Low-Power library can make it really low-power. 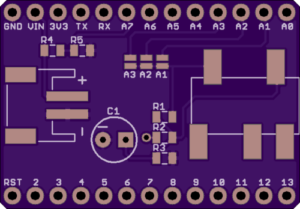 The Moteino Energy Monitor Shield schematics, board layout and firmware are released as free open hardware & software and can be checked out at my eMoteino repository on Bitbucket. 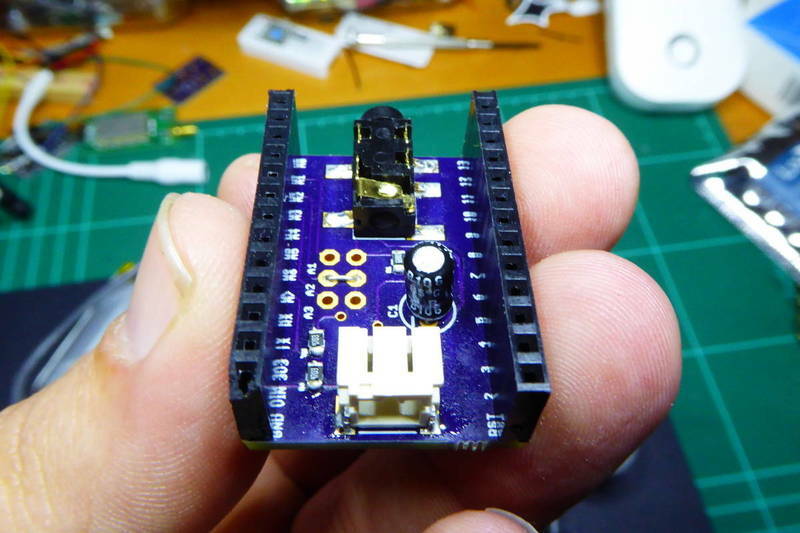 Also, you can order the Moteino Energy Monitor Shield v0.2 board from OSHPark. From the hardware point of view you have different options. First, depending on the current clamp you are using, you might need to use an external burden resistor. Basically you need to know whether your sensor outputs a “voltage” or a “current”. If the former you will probably read something like “30A/1V” somewhere in the sensor body or in the datasheet. If the later it will read something like “30A/15mA”. 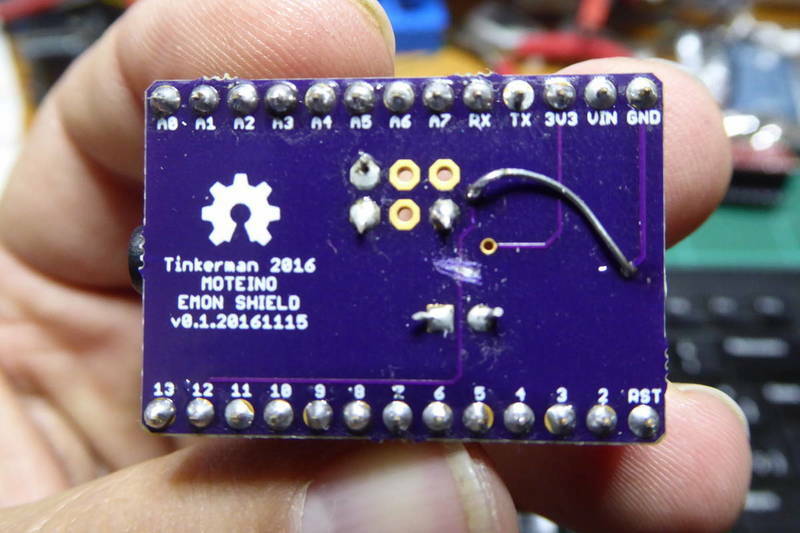 If you have a current you will need to convert it to a voltage so the ATMega328 in the Moteino can read it. The way to do it is adding a burden resistor across the clamp outputs. Head over to the Open Energy Monitor project for more info about how to calculate the burden resistor. In my case I’m using an EChun ECS1030-L72 with a 1:2000 turn ratio, so I used a 68Ohm resistor so I can read roughly 30A per volt output. (30A * 68Ohm / 2000 = 1.02V). The max output voltage (1V in my case) times 1.41 (the square root of 2) has to be less than half the reference voltage. Second you have to choose the analog GPIO you will use to read the current sensor output. 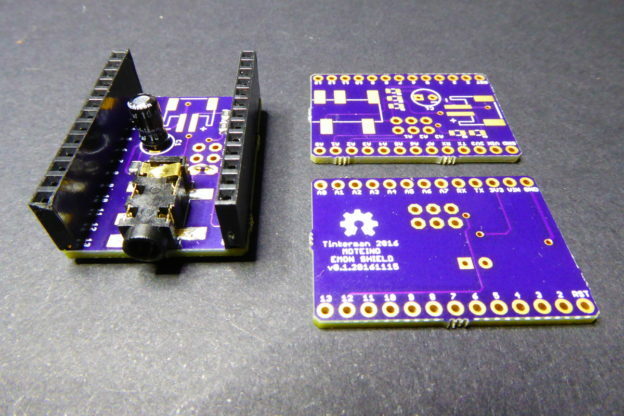 You can choose between A1, A2 or A3 by adding solder over the appropriate solder jumper. If you are stacking more than one shield make sure you use different analog GPIOs for each one. Third choice is to enable battery monitoring. If you don’t need it, just don’t add the lipo connector or the battery monitoring voltage divider (R4 and R5). Also if you stack more than one shield, you just need to add those to one of them. The Moteino with the Energy Monitor shield. The black clamp with grey cable is plugged to the shield. 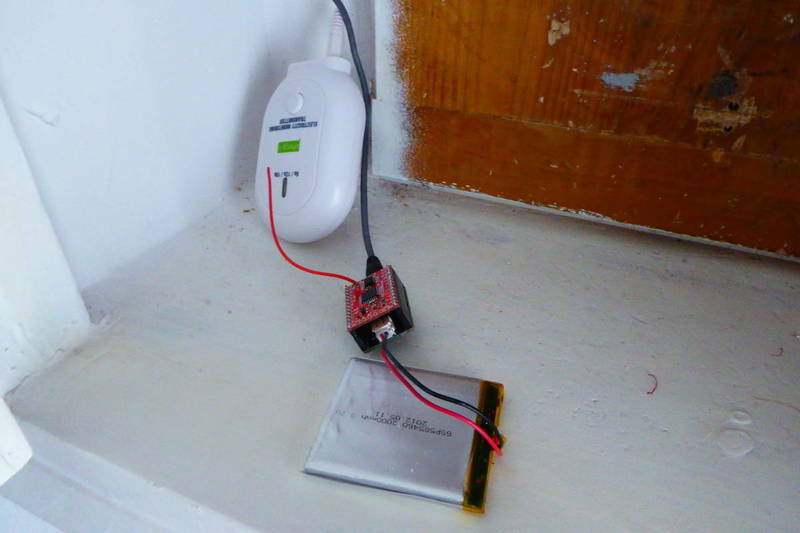 The grey clamp with white cable belong to the Efergy sensor I have at home. You might have noticed that I’ve been talking about v0.2. Pictures in this post are from v0.1, like the one bellow. 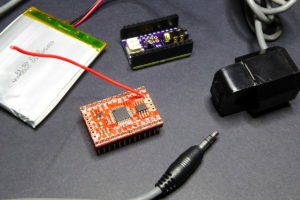 My first design included a battery monitor with the downstream resistor connected to GPIO12 instead of ground. 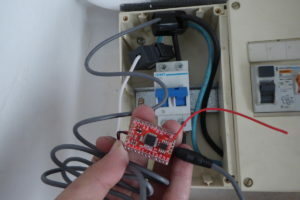 The idea, suggested by user “john k2ox” in the LowPowerLabs forum, was to save some energy by setting the pin in high impedance mode while not reading the voltage. I don’t know why it does not work but when you set the pin to OUTPUT LOW the analog GPIO keeps on reading the VCC voltage instead of half the battery voltage… As a quick fix I cut the trace to GPIO12 and solder a wire to ground instead. After all we are talking about 3.3V / 940k ~ 3.5uA. Also you might have notice the solderpads in v0.2 were simple jumpers in v0.1. Truth is that the 2×3 header I wanted to solder there barely fit under the Moteino. 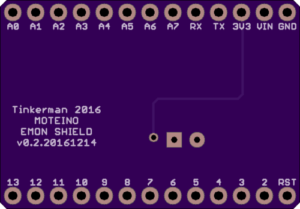 The Moteino Energy Monitor Shield schematics, board layout and firmware are released as free open hardware & software and can be checked out at my eMoteino repository on Bitbucket. You can configure almost everything from the settings.h file (you will first have to make a copy from the settings.h.sample). In particular pay attention to the CURRENT_RATIO constant. I use to compare values with other power meters I have at home (an Efergy, a no-name chinese one and a current clamp) and I modify this value to match the other’s readings. Currently the firmware only supports one line. Will be adding support for up to 3 readings soon. In the meantime my RFM69GW gateway is receiving packets from my Moteino energy monitor. Moteino Energy Monitor Shield by Tinkerman is licensed under a Creative Commons Attribution-ShareAlike 4.0 International License.